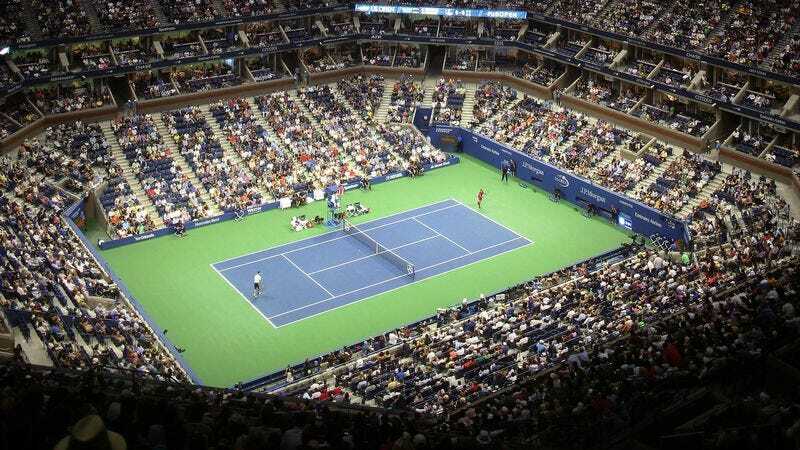 NEW YORK—Members of the United States Tennis Association offered a public apology Monday for the ungodly amount of tennis that has been played, promoted, and discussed during the U.S. Open. “We want everybody to know we realize how much tennis is going on right now, and we understand how truly sickening that must be for all of you,” USTA executive director Gordon Smith said. “Men’s tennis, women’s tennis, doubles tennis, amateur tennis—did you know we even have a tournament for wheelchair tennis? It’s just a shitload of tennis, and we are really goddamn sorry about it.” Smith added that even though it’s gotten to the point where he never wants to see another tennis racket in his life, it’s still pretty cool when Roger Federer hits the ball really hard between his legs.